FishinTopsail.com features fishing reports from Surf City, NC and Topsail Island. We strive to keep our site kid friendly. If you see anything that you would not want your child to see, please let us know. Thanks for visiting. Tell your friends about us. Thanks to Jolly Roger Fishing Pier in Topsail Beach for the pic. Check out the pier website HERE. Surf City Ocean Pier Inc.
No license required to fish from pier. Topsail Island's first ocean pier, the Surf City Pier was originally built in 1948. It has been owned and operated by the Lore family since 1973. Though it has weathered many storms (some better than others), Hurricane Fran destroyed it in 1996. It was totally rebuilt and reopened in August of 1997, looking much like it does today including a few additions. The Surf City Ocean Pier comes complete with large assortment of bait, fully stocked tackle shop, an eclectic collection of souvenirs, fresh ground chuck burger's from the grill, and a screened in dining area. The pier is 937 feet long with a 40-foot octagon at the end. Also included are two large fish cleaning stations with fresh running water. Plenty of lighting for all night fishing. A well lit parking area. We have added and improved our Outside Dining area so come have dinner with us. You will be glad you did. Try the Surf City Ocean Pier Grill. "Best hand made hamburgers and hot dogs on the beach!" All without leaving the fishing pier! The Musquito Cheeseburger is a must have while fishing.... If you aren't fishing, you can dine outside on the "deck." Take-out is available. Located on the top floor of the St. Regis Resort, The Topsail Shrimp House's panoramic view of the ocean is hands down the best ocean front view in North Carolina. Each and every table has it's own view of the beach with binoculars available to view marine wild life. We are located at the St Regis Resort in North Topsail Beach, NC. in Building two on the 7th floor. Asahi features a menu of Chinese foods complete with a sushi bar. Open daily for lunch and dinner. Eat in or take out. Family style, seafood Open for breakfast, lunch and dinner. Fresh, Southern-style seafood with an magnificient view of the Topsail Waterway. Open nightly at 5 pm for dinner. Seasonal hours, call ahead. Sneads Ferry just off Northern Topsail Island. Rick's is becoming a local favorite for sports fans and casual diner's alike. Large bar with plenty of seating, big screen TV,all food cooked to order. Rick's has all ABC permits and is open year round. Rick's is proud to be an official Steel City Mafia Hangout. A Steelers game at Rick's is exciting and we guarantee you will be in the company of many loyal Steeler fans. If you are an extra-enthusiastic fan, join the Steel City Mafia Fan Club at Rick's. With a long tradition of dinner plates heaped high with your choice of fresh fried seafood, french fries, slaw and hush puppies. A local favorite open for lunch and dinner. Home made lemon and chocolate pies, Sooooo Gooood! A Low-Country and Caribbean menu is the speciality at the Crab Pot. Spicy seafood gumbo, jerk chicken, fresh seafood and more for a casual dining experience. Meals can be taken away or enjoyed in the screened in dining room/bar. On selected summer evenings you might find live entertainment and/or shag lessons. Children's menu available. Full ABC permits. Closed for the winter season. Upscale Dinner. New waterfront location with our same fabulous menu including: fresh seafood and pasta, chicken, prime rib, center-cut beef and pork. Separate full-service bar. Available for catering. Enjoy your favorite dish with a bottle of wine from our extensive list while watching the sunset over the Intracoastal. Buddy's features spectacular oceanfront views from our covered outdoor dining porches. Our menu includes an extensive variety of seafood, steam buckets, ribs, steaks, & chicken, & features our award winning homemade coconut cake! Enjoy drinks & ocean views from our upper Captain's deck with family & friends, & the kids will love the pirate hats! Smiles, sun, & fun meet the Atlantic Ocean @ Buddy's, 101 Roland Ave. Surf City, beside the city's Gazebo, serving the Coastal Beaches of Wrightsville & Surf City for 28 years!!! Come join the fun, 7 days a week from 11:00a.m. until . . .
Domino's Pizza offers free delivery to Topsail Beach, Surf City, North Topsail Beach and Holly Ridge. Besides pizza, we offer chicken wings, hot, mild and BBQ. Try our Cinna-stix, chicken wings, cheese stix and chicken kickers. Try one of our hot, fresh-baked sandwiches. Mainsail Restaurant offers a well balanced menu of fresh grilled fish with savory sauces, Maryland style crab cake, steak, pastas, and home made desserts with a full bar and eclectic wine selection. Mainsail offers both on-site and off-site catering for all your wedding and party needs. Barry and Sons - Billy, Joey and Alex. Quartermaster's Restaurant & Tavern features fresh seafood and American cuisine with a smoke-free dining room, full service bar with Direct TV sports package and on and off premise catering. We serve dinner nightly on the Surf City causeway, which is on the mainland side of the Surf City swing bridge. House specialties feature: Crab Dip, Buffalo Shrimp, homemade soups, the Blueberry Salad, Dirty Chicken, Shrimp and Crab Au Gratin, char-grilled New York Strip or Ribeye and the Captain's fresh Seafood Platter. Our goal at Quartermaster's is to present a warm, relaxed dining experience, featuring quality food, affordable prices and excellent service. to as “Mama Lek”. Mama Lek was born & raised in Lobpuri , Thailand and is daughter of a true Thai buddist monk. Mama Lek’s food & recipes have been passed down for generations and are truly awesome! Owners Ray & Alicia have teamed w/ Asian trained chef Travis Obertach to create a menu that has something for everyone. Only the freshest seafood, meats, produce, herbs & spices are used. The daily lunch & dinner specials are fresh, imaginative & truly delicious. And everything is priced just right & affordable for every budget with very large portions – so come hungry ! Thanks to Surf City Ocean Pier for these tide predictions. Whether you are the avid fisherman or a family looking for a fun day on the water, we can accommodate your needs. Fish inshore for Spanish Mackerel and Blues or venture out to the “Graveyard of the Atlantic” for some excellent bottom fishing and trolling for dolphin or king mackerel. Open charter dates are filling fast! One of the longest piers in North Carolina, 1,000 ft long. 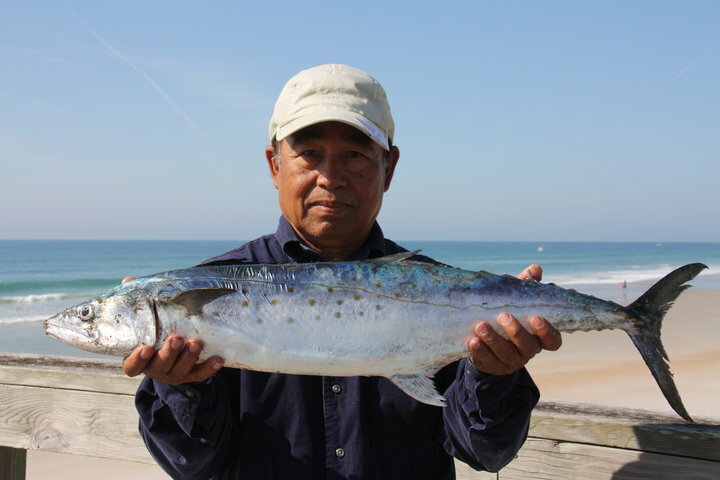 Sea View Pier is located in North Topsail Beach, NC and offers a variety of enjoyment for everyone from relaxing on our clean beaches to King Mackerel or bottom fishing on our pier. And, while you are here, you can also enjoy our well stocked bait and tackle shop and dine in our clean restaurant. Thanks for allowing us into your home with this message. We all look forward to seeing you soon at Sea View Fishing Pier. The Jolly Roger Inn provides excellent oceanfront accommodations in the village of Topsail Beach, North Carolina. The Jolly Roger Inn has 65 rooms, efficiencies, and suites; most have balconies with outstanding views of the beach strand and the Atlantic Ocean. Our experienced staff takes pride in providing our guests with true Island Hospitality!